The Palm Beach County Sheriff’s Office is seeking the public’s assistance identifying a masked suspect WANTED for Armed Business Robbery to Kwik Pic, Lake Park. An unknown male, seen on surveillance, entered Kwik Pic, ordered the victim to remove an undisclosed amount of cash from the register then forced the victim into the freezer before fleeing on foot. A red Cadillac was seen driving away from the area at the time of the robbery. This incident occurred on January 23…, 2019 at 8:35 pm. Kwik Pic is located in the 9300 block of Alternate A1A in the Town of Lake Park. 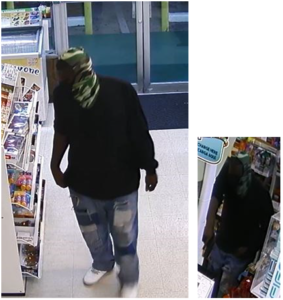 ← The Palm Beach County Sheriff’s Office is seeking the public’s assistance identifying a suspect WANTED for using counterfeit money to purchase a gift card.